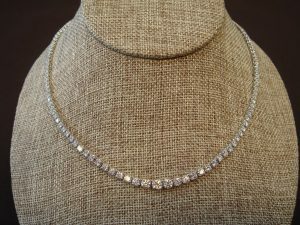 6.1ct tw Diamond Tennis Necklace In 14K White Gold Appraised value: $12,598 get it here for much less! 14 karat white gold graduated diamond link necklace totaling 6.1 carats. Contains 137 mounted round brilliant cut diamonds ranging from 1.4 mm to 4.4 mm. This piece is 16 inches long with a hidden clasp and safety. Total weight, including diamonds is 19.1 grams. Professional appraisal included with purchase.